I have come to learn something. It seems as though every other person living here is under the immutable belief that there are magical forces at work in our home. They seem to believe this magic capable of making their dirty socks walk from the living room floor into the bedroom hamper. They are convinced this magic can load a toilet paper roll onto the holder. 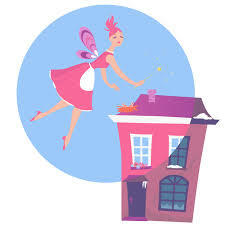 It is apparent that the magic of our home is also believed to feed and water pets, hang up jackets, rinse dishes, cleans toilets, wipes up spills, and turns off lights. As the only person here who seemed to be unaware of the magical status of this home, I often questioned the actions of the troglodytes who share my home. However today, I discovered the magic. As I picked up an ice cube tray from the counter I found myself asking, "does he think this thing is going to magically refill itself and then place itself in the freezer?" That is when it hit me. This home is magic. Because their is a mystical force that does all of these things for these ungrateful hooligans. Me. I am the magic in my home.